Very often, we wonder, sitting in the quiet of our homes, while the TV blares intermittently, how people out in the streets start turning violent. The state is always quick to respond with water cannons, tear gas, and ofcourse lathis. The urban contexts in which these demonstrations turn violent, is ofcourse already febrile. People come out in the streets when they have no water, electricity, food, or freedom. The crowd gathers because of rumour, or because some event has excited their emotions beyond their tolerance. The urban landscape is dotted by ghettos of the underclass and the underpaid. 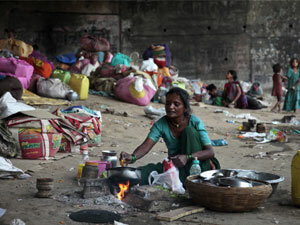 They may be sweepers, maids, cooks, manual labour at construction sites and ofcourse unemployed people waiting for work. Underclass is a pejorative term, which suggests underworld, and possibly criminal tendencies. What is poverty, is a harder question, since “hunger” is the lowest common denominator of our potential analyses. The masses, as we call them, have always according to popular visual evidence, lived on roti and pickle. This is a gross understatement of their actual potential to live off their fields (when there is no drought,) and they have access to maize, millets, wheat, rice, vegetables, fruits and berries. Those who have no land, resort to what we know as thieving, which is to raid other people’s fields and survive on what they are able to get, whether paddy or sugarcane. There is hunger and then, there is survival. These are the two book ends of existence. In this world, which is so bleak, and so terrifying, opium addiction, gum sniffing, begging, prostitution, dacoity, murder, suicide, and all that which the middle class sees on it’s daily diet of news, is an ever present reality. These people live on the margins of society, and they have their own code of conduct. If this world exists, it is what Manuel Castells, in The Urban Question, calls the “order of capitalism’. A century and more ago, Charles Dickens described it well, explaining much as Marx, Weber and Durkheim did, at the turn of the century, why disjunctions are so frequents, and sometimes extreme. Crime and punishment are the watch words of this rapid change. Capitalism, with it’s hegemonic forms of exclusion, then begins to display it’s basic premise that those who have, will profit at the cost of those who do not have. Everytime, the middle class visits the mall, it sees the world which is constructed for it’s benefit but which it does not really own or control. It is a visual feast of objects displayed as beautiful and exclusive, where window shopping is possible, and during the time of the sale, buying a garment or two is possible. BPO workers and the intelligentsia are drawn into the mall, the chain stores also provide the possibility of buying cheaply when seasons change, or new fashions come into place, and the old stock has to be got rid off quickly. The middle class thus becomes absorbed into the symbols of the wealthy, and momentary though it is, it takes them far away from the world they are really familiar with. Everyday hunger, everyday poverty is explicit, and they are not sealed off from it. In the 1960s, the term “standardisation” was offered by Clark Kerr as an explanation of how industrialisation would bring about a common parameter of similarity. Everything in industrialised societies would begin to look alike. Today, when the intelligentsia leaves a carbon trail, much like computer executives did in the last decade, we may ask, how does consumerism affect the architectural experience of being a traveller in the skies? Each airport looks the same, and with the appropriation by the working class too, into air travel, the symbols of assimilation with the middle class becomes more than apparent. Masons too, on the way to Sri Nagar, or Coimbatore, whether coming from Malda or Patna, sporting expensive watches, buy decoction coffee and carry their worth to the company they represent with great composure. The trickle down effect of capitalism comes into play, where the possibility of wearing branded clothing, or flashy mobiles, defines the commonality of the acceptance of the branded logo, whether Nike or Samsung. The intelligentsia no longer responds to the clamping down of workers in factories, because they too are absorbed by the unity of this seeming equalising world. Fit bodies, smart clothes, stylised hair cuts seem sufficient to suggest that there is mobility among the working class. The real story of poverty, every day hunger, thus gets sidelined. When there is drought, or famine, the contractors can marshall more of the poor and hungry to come to work in the city. It does not matter which political party controls the offices of the state, as the ideological machineries of capitalism are impervious to these issues.